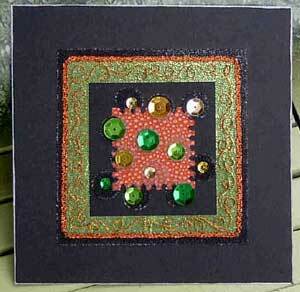 28-count dark green fabric, about 9" x 9"
Each square on the chart equals two fabric threads. With one strand DMC 500, work cross stitches of background and shadow areas. Form metallic cross stitches using one strand of each fiber as listed on key. Work the lower wing portions first, and then the upper portions. 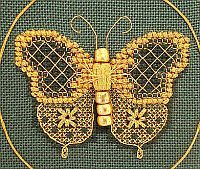 On the upper portions, ribbon cross stitches and perimeter 3/4 stitches, will conceal the fine cord backstitches of the wing outline. 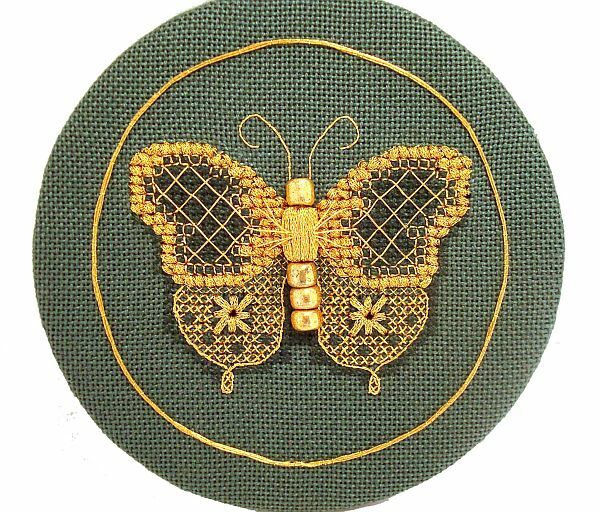 Using one strand of Japan #5 002J, backstitch around inner motif of upper wing portions. Algerian Eye Stitch and Jacobean Couching are worked over the completed cross stitches we have made as background areas in Step 2. 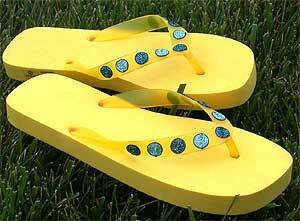 - With one strand of 1/16" Ribbon, work Algerian Eyelets (up at 1, down at center, up at 2, down at center, etc). 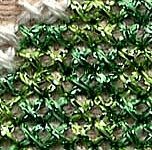 - Using one strand of Japan #5 for laid thread, and one strand of Japan #1 for anchoring thread, work Jacobean Couching stitch as follows. 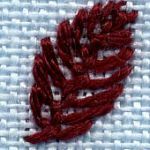 For this project, laid threads are long, straight stitches placed across the top of completed cross stitches. Come up at 1, down at 2, up at 3, down at 4, etc. Work all threads facing one angle, then cross back with all threads of the opposite angle. Anchoring threads hold laid threads in place. Referring to dots indicated on chart: bring Japan #1 up at point, over intersection of laid threads, and back down at same point. Continue until all marked intersections are secure. Couch Japan #5 to stitch antennae to fabric, using one strand of Japan #5 for laid thread, and one strand of Japan #1 for anchoring thread. Bring laid thread up at right and hold with left thumb while working. Bring anchoring thread up at 1, down at 2, up at 3 etc. Repeat until all laid thread is anchored. Secure ends to back. Complete outline of lower wing portions using Whipped Backstitch. Bring one strand of Japan #5 up at point where wing sections meet at outside edge. Working in direction of arrow, wrap thread around backstitches without entering fabric as illustrated, following outline around and stopping at body. To make body, cut about a 12" length of 1/16" Ribbon and thread onto a small tapestry needle. Place two pebble beads end-to-end and draw ribbon through center of bead pair, leaving about a 2" tail. Wrap beads with ribbon by going out around and up through center, placing each wrap side-by-side. Do not allow fiber to twist or overlap. Continue wrapping until cylinder is covered. Allow ribbon tails to remain at each end; do not trim. 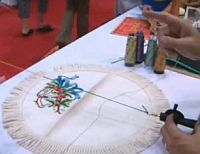 - Complete body assembly by threading four plain beads onto ribbon tails; placing one above the cylinder for the head, and three below for the lower body. To attach body to design fabric, draw ribbon tails into fabric at points indicated on chart. Secure tails through back of stitching and cut off excess. - Continue securing to fabric by tacking between head/body, and the three lower body joints using one strand of Japan #1 to come up through fabric, loop over ribbon, and draw back down into fabric. - The last step in attaching the body to the design fabric is an over-the-top style embellishment. it is very simple to do and adds great dimension. Straight stitches are worked using one strand of Japan #5 as shown in diagram, and enter/exit the cylinder between the beads and top layer of ribbon. Straight stitches of the model crossed under a span of three ribbon widths. Border is couched to design fabric using the same couching method as described in Step Six. One strand of Japan #1 is used as the anchoring thread. However, four strands of Japan #5 are used here as the laid threads. - Begin by bringing one strand of thread up at each point indicated at lower center border on chart. Lay all threads together and anchor to fabric, following circle. 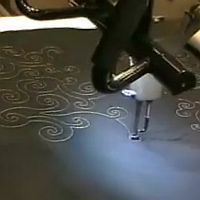 To end, draw one thread back down through each of the same points where the thread begins. Complete anchoring, and then end threads by wrapping them into back of stitching. Frame, or insert into a premade jar lid. 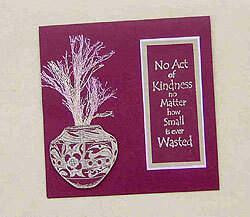 Click here to download the FREE instructions for this design. You will need the FREE program Adobe Reader to view and print this file. If you have trouble downloading this file and would like us to send you a printed copy send a #10 SASE to: Golden Butterfly, P.O. Box 1258, Parkersburg, WV 26102.